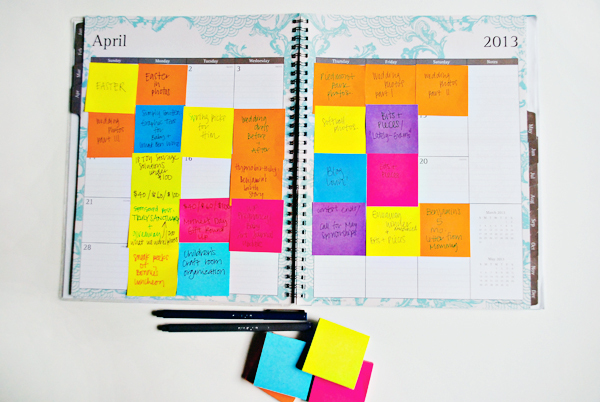 Before I had Benjamin last Fall, I wrote about getting organized. I set a new system in place for blogging, as well as bill and idea keeping. I knew this would be imperative with a new baby! It has now been over 6 months since I started and has helped everything run a lot smoother for me. I have been blogging for 8.5 years (wow!) and just now feel like I have a system that works for me. I thought I'd save you the trial and error and share some of my favorite blogging tips and resources. 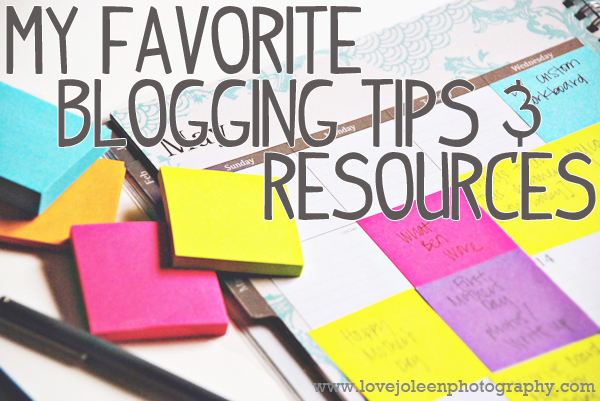 Tip #1 Gather blogging supplies and *keep them together. 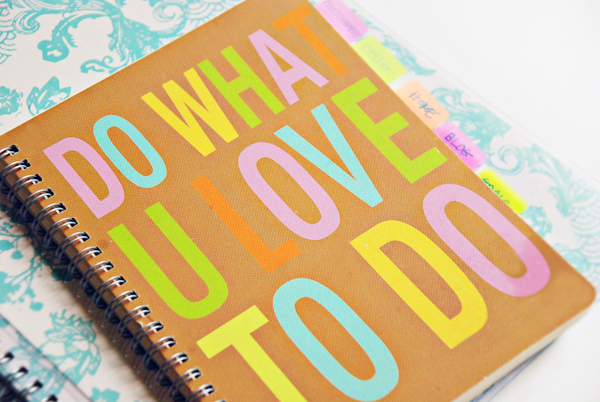 For me this includes my notebook, blogging calendar, pens, and small post-it notes. They're easily accessible at all times. 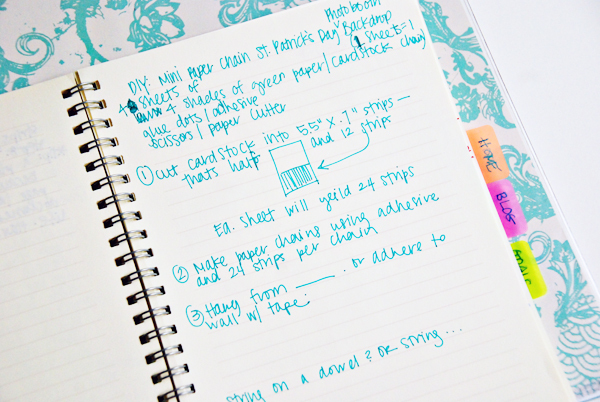 Tip #2 Keep a notebook. I picked up a small lined notebook, divided the pages into sections, and created my own tabs for photography, design, home, blog, and goals. 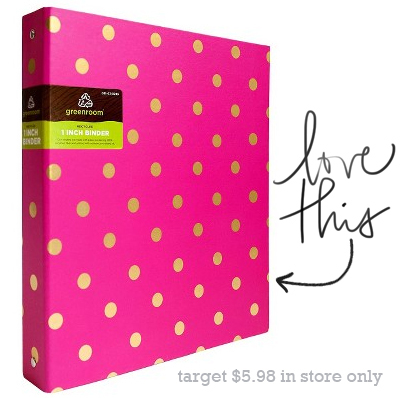 I recently saw this small hot pink with gold polka dot binder at Target which I LOVE! They have colorblock binders in the same small size. The nice thing about them is that you can reuse them in a new year and they sell the dividers, pages, and page protectors in the same small size. For now, I have my system in place, but when my pages are filled I will definitely keep my eyes peeled for a binder like this one! It's important to keep all your ideas and running lists together. I can't tell you how often I've wasted time looking for that scrap of paper or random list I put somewhere and never found. *This is the exception to the rule of keeping all of your blogging supplies together. My notebook goes with me everywhere. It's random and isn't pretty but holds a lot of information and ideas. Which brings me to Tip #4 Analyze your blog content to establish features and a blogging schedule. This mostly pertains to those that are still finding their niche in blog land but routine can be a good thing. It lets people know what to come to expect from your blog and helps you to establish a following. 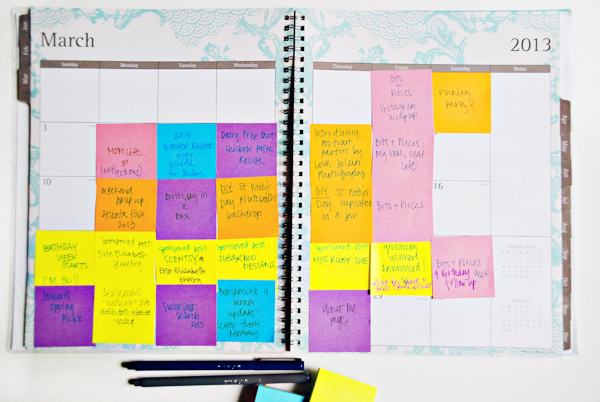 Start by writing a list of subjects you want to write about each week, month, and on occasion. From there you can take it a step further to establish which day of the week/month/whenever will be dedicated to a specific topic. Finally, Tip #5 Clean up your blog. If you've taken the time to create this personal online space then it should look like it to your readers! Do a little Spring cleaning and get rid of the clutter. Often. My number one favorite blog resource is PINTEREST! I am constantly pinning blog related tips and inspiration. There is a wealth of information to be had here. Some of my favorites include Primp My Blog by Her New Leaf, Blog Branding 101 by The Flourishing Abode, Creating My Media Kit by The Bosy Budgeting Mama, and The Geek Girl Chronicles of a Blog Design Enthusiast by Pugly Pixel. Fonts >> I am obsessed with them. Find a few you love and stick to those on your blog to maintain a cohesive look. I mostly get my free fonts from dafont.com. For 100% free [for commercial use, too!] fonts check out Font Squirrel. For unique fonts for purchase (like the font used for Love, Joleen) I like MyFonts. Photo Editing >> It doesn't matter what you write about, people like to see nice photos. I edit my photos using Adobe Photoshop. I personally prefer larger photos on a blog but not so large it looks ridiculous. I keep mine to 600 pixels wide. Here is a great tutorial on How to Batch Resize in Photoshop. One of my favorite blog tools is this Image Map Tool. If you're not familiar with an image map it is, "a list of coordinates relating to a specific image, created in order to hyperlink areas of the image to many destinations (as opposed to a normal image link, in which the entire area of the image links to a single destination)." It's not as complicated as it sounds. Here is an example of an image map I created using this tool. 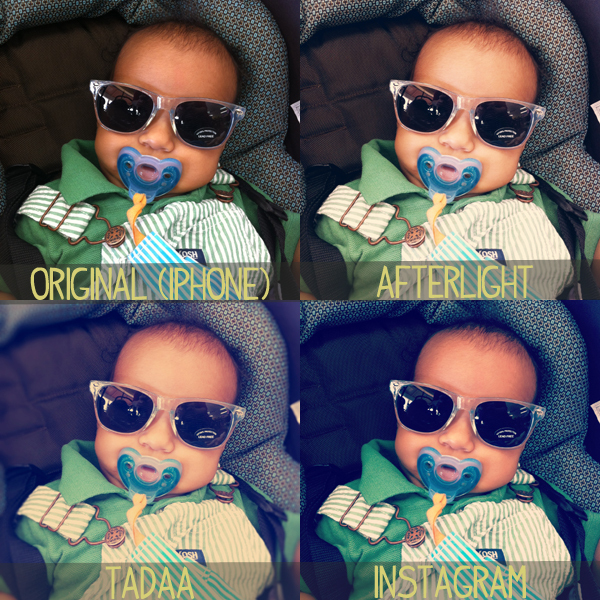 AfterLight - $0.99. Most used. My favorite filter is "Captain". Tadaa - $FREE.99. My favorite filter is "Kraftwerk". This is the best app I've found for adding blur; it's the most manageable. Instagram - $FREE.99. I've switched between favorite filters. I usually edit using another app but I do sometimes like to use "1977" for a red finish and "Nashville" for a blue. They have my favorite black & white filter, "Willow". Fuzel Pro - $1.99. I recently bought this app as an alternative to "Photo Collage". With a subtitle like "Collage Made Awesome" who could resist? What can I say? I'm a sucker. So far, I'm loving it. Lots of different collage capabilities and even some filters. Tomorrow one of my favorite blogs, A Beautiful Mess, is coming out with an app. You can bet your bottom dollar I'll be buying it. I hope you found My Favorite Tips & Resources to be helpful! If you have any questions or think of anything I missed, please don't hesitate to leave me a comment. Do you have any tips or resources you'd like to share? Let me know that too. As always, thanks so much for reading! PS - The explanation to that collage is that my son is a freak. 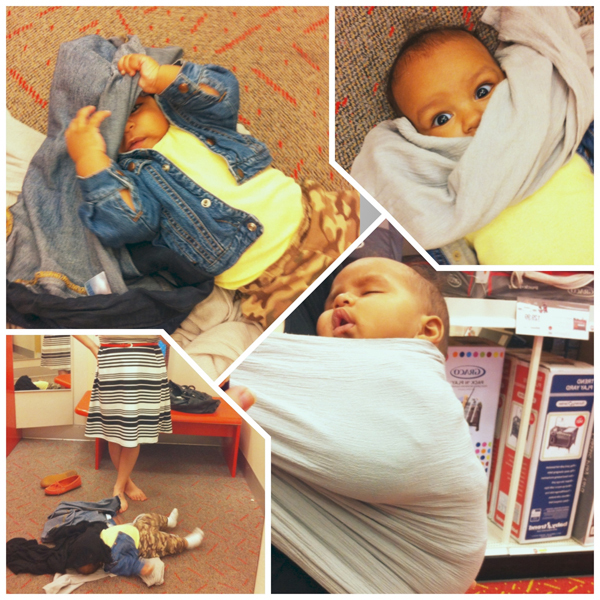 This is how he rolls at Target. I don't know what is up with him but Ben and I are constantly cracking up because he pulls everything over his head then stiffens and breathes heavy until you take it off. He won't NOT put something over his face if its there. One by one I took things away as I tried to try things on in the fitting room. He's a goof.